for nearly 19 years (i’m certain i started to wonder nearly the moment i found i was pregnant) i have wondered what this day — this very day when we will lock the house one last time, lug bags down the walk, climb in the car, head off to college — i have tried high and low to figure out what it would feel like. to, um, send my firstborn, my lifeblood, my sweetboy, to college. i awoke at 3 in the morning, just lay there, felt a pain in my chest. for once, though, didn’t think it meant i was having a heart attack. i knew what it was. the beginning of yet another labor. no water bag broke. no squeeze around the middle, from upside the legs. but it is labor nonetheless. next came the hollowness. hollow. hollow. hollow. that’s how my insides felt. i whispered every benediction, blessing and vesper i could muster, and a few i couldn’t even put to words. then i got up. ambled straight to the college-bound bedroom, kissed the forehead i found lying there asleep. made a sign of the cross with my thumb, just the way the bishops taught me to do it long, long ago. that boy fluttered open his eyes, “hullo mommy,” he said, smiling, most likely seeing my tears. and there will be more. right now, though, i find i have a long enough list of things that need to be done. minutes ago, i was called to the college-bound bedroom. a packing crisis was underway, and the boy asked if instead of typing about his going away, i might just give him a hand. a real one. so i got with the program, and helped the boy re-pack a suitcase of breakable things he thinks he’ll just bring on the plane. too late for a little mini-lesson on why that’s not so wise. i’m not sure, though, if i really want that sorry short prayer taking up space on my God list today. i might bump it off for one of the others. and so, that big fat prayer now outa the way, i should move on to trembling. for that’s what it feels like inside when your motor is revving, and your nerves are all jangled. because you really don’t get it, don’t get how for 18 whole years your every night and every day is consumed with watch-keeping. not so many years after that, you kept watch whenever you drove in a car, and you could glance in the rear-view mirror, gauge his mood, how his day went. you’ve been tossing an eyeball his way since as long as you could remember. and now, no matter how hard you try, no matter what sort of magical spectacles you slip on your face, you won’t see what he’s doing, where he is, what sort of smile he wears, or how much his eyes sparkle. oh, you’ll imagine. and maybe, if you’re lucky, you’ll dream. you’ll see him bouncing around in your dreams. i know what it is to fall asleep hoping you dream about someone you miss. i did it for years, hoping to dream of my papa. right now though, i need to imagine him strong and safe and thriving. i need to picture him in his glory hallelujah. the boy is headed straight to where he belongs (minus the hurricane). i suspect i’ll ride the waves of this labor all weekend long. till the final push. when someone tells me it’s time. time to go now. time to look straight in his eyes one last time, time to open my heart for one last gulp of pure holy child. and like that, i will wrench myself away. turn to the little one who will be sobbing by then. i will walk away from one child, hold tight to the other. for now, though, there’s a long day of packing. and loving. and loving. and boarding a plane, straight for the path of the hurricane. this is bound to be a drop-off for the record books. the photo up above was taken last night, the last night willie slept in this house before college. 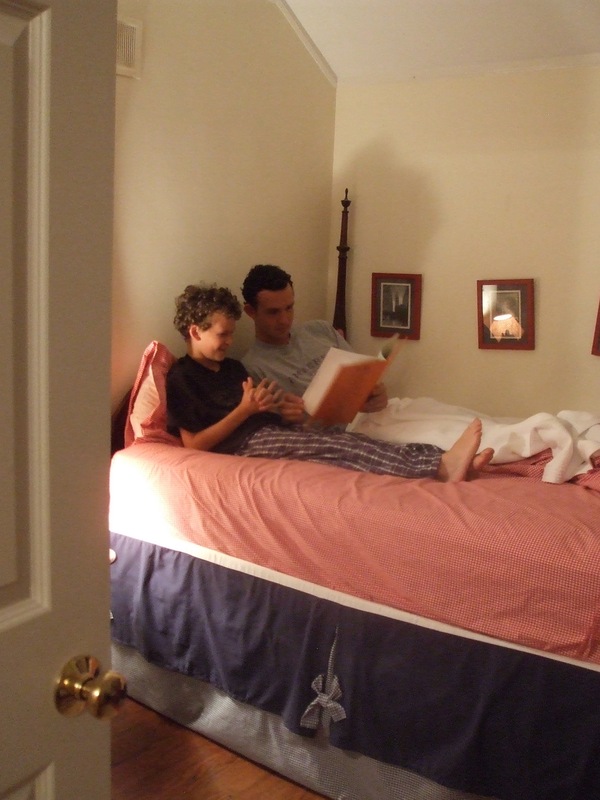 his little brother wanted him to climb in bed and read him a story. they picked dr. seuss’ “the butter battle book.” i listened in from the stairs, heard willie tell teddy, “i love you very much.” this morning there was a 5-minute hug in the hall. this parting is downright painful for the little one. if you’ve got a spare prayer, whisper one for him. and there we go: i decided to write my way through this passage, the college send-off. and so i did. bless you for indulging me. and thank you for your patience. i know i am not the first to do this, nor the last. but in my book, it’s all new, it’s all raw, and it begged to be put on paper. so that’s what i did. i’m sure i’ll write at least once about the quiet that comes once we’re home. you would have thought it was an instrument for which i needed a license, the way i wielded it, the way i darn-near steamrolled whatever got in my way. stand back, was the only word of caution uttered. i had my hands on a certified defense weapon, with sticky side. all it was, was a roll of Scotch brand shipping tape. heavy duty, specified. i made sure i got the strongest one known to humankind. i’d bought two rolls (can never have too much). weeks ago. had let them idle beside the pile of dorm essentials tucked in the living room corner, the pile i tried to pretend was not there. i knew that some day soon the hour would come when it was time to turn the flattened cardboard boxes back into three-dimensional pop-up vessels. when the fallen trees would be called upon to do their duty: to get my firstborn’s college essentials–the memory foam mattress topper, the shower caddy, the over-the-door towel rods, the extra-long twin sheets (monogrammed, thank you)–to the room where they’d be home. 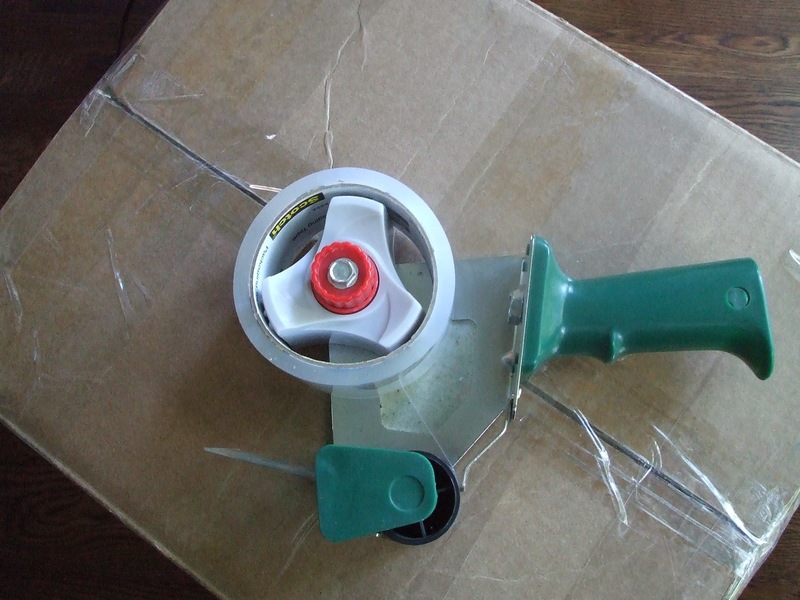 so there i was, alone in the living room, when at last i lifted the gizmo that unfurls the tape. it’s heavy. it’s plastic- handled. it’s got one sharp cutting edge that can rip the dickens out of your mortal flesh. i started strapping strips of tape. it hit me right away: i liked the feel of all that sticky gooey plastic holding in the contents of my firstborn’s brand-new life. i strapped and strapped. cut nice long slabs of tape. slapped ‘em, sealed ‘em, ran my palms smooth along the not-sticky side. suddenly i realized i was taping as if there was no tomorrow. i must have used half a roll of tape. on the first box. then i got to the second. was overcome with need to tuck in one last love note. hope that strapping 6-foot-something lad doesn’t mind that i grabbed a sheet of construction paper. pink construction paper. and with my favorite zig-zag scissors, i cut out a little pink heart. wrote, in red, “forever my beloved.” or some such words. it’s all a blur now. i was in a fevered, sticky-taped frenzy when i did it. all i knew was that suddenly i was aswirl in out-of-body incantation. i was taping each and every box as if mere Scotch brand tape could keep my boy from harm. from any harm. i wasn’t so much taping to keep the boxes from splitting in the UPS truck. i was taping to keep my boy safe on the side of the mountain he’ll climb in freshman orientation. i was taping to give him strength on the all-nighters i know he’ll pull. i was taping to avert the stern glance of some professor who some day might tell my boy a thing or two about the responsibilities of scholarship, should he dare to blow a due date on some 90-page thesis. i was taping against the heartache that will come if some day he loves someone who doesn’t love him back. i was taping to keep him afloat in all the rivers, in all the boats, that he will row. and that’s when i realized, once again, that motherprayer is so much more than words. it’s what we do and breathe. it’s stirring oatmeal on a winter’s morning, it’s using half a roll of tape to seal shut, to protect, a box of sundries for a college dorm room, as if in simple acts of stirring, sealing, we can wrap our children–even when they’re no longer little ones–in a sacred shield of holy light. impenetrable, we pray. “be safe,” the final words we whisper every time. words that, now, mean so much more than simply, “i love you.” that’s understood, implicit. “be safe” is motherprayer for when you send your child, the fruit of your womb quite frankly, off into the world, a world you can’t control, a world that some days, some dark hours, shatters you. “be safe” is hope and faith boiled down into two short syllables. “be safe” is the last line of defense, the thin membrane on the other side of which prayer and holy angels pick up the load. and some late-summer afternoons, when the sun slants in the front-room windows, illuminating your task, as you tape and seal five boxes, there are no words. only the mad wrapping of a mother who will not let harm come to her child—or his memory foam mattress topper. and what are the wordless incantations, the rituals you repeat, as you aim to keep the ones you love from harm in any form? one week from today, our head-off-to-college date. all this week, mamafriends of mine have been shuttling children to the college campuses where they will spend the year. lots of soggy pillow cases, right in here. lots of feeling lost. back at home, that is. pray to God, not in college dorms. as hard as it is for us, may it not be hard, dear God, for our children who are spreading wings and taking flight…..
i’ve known for years that i was a creature of habit, a girl who liked her days to unfold with familiar rhythm. you might call me a homebody. a nesty girl. or worse. what i know is that the familiar soothes me. i sink into sublime inner hum when i unlock the door and come back home. when i hear the ticking of the clock i have wound 3,000 times. when my foot hits the one odd floorboard, just to the east of smack-dab middle at the top of the stairs, a creak that tells me i am here in the house that holds me. a creak i know is coming before i ever get there. a creak that sings the song of home. i like when my car practically steers itself to the grocery. knows the corner where to turn, knows the bumps along the way. i like passing under the heavy limbs of oak and ash and elm along the way; limbs i’d notice were missing if the shadows weren’t there one morning. i am a girl comforted by the balm that is my everyday routine. and right in here, where all around me seas are roiling, shifting, shaking, i am soothed hour after hour by the little stitches in the whole cloth of my life. in the living room, right now, five fat boxes stand in sentry rows. nearly two-thirds filled, they hold the whole of my firstborn’s college life. they’ll be sealed shut soon. a new address — AC # 1056; i’ve already memorized — slapped on front. shipped east. to be unpacked on one wobbly sunday coming soon, when for the last time i will try my hand at putting order to his life. or at least his dorm room. my little one too is about to take a big step for a not-so-big boy. nearly lost in all the college swirl is the fact that the little one has left behind his “little school,” and is moving on to middle school, a school with many floors, and combination locks. a school where four times as many kids will roam the halls. all around, the world i know is just about to change. and i find anchoring, find knowing, in the simple building blocks of my every day, the way each morning i splash my face, slide into rumpled, hem-torn shorts, hip-hop down the stairs, click on the radio to the voices who greet me every morning. the way i make my coffee every day — five scoops coffee, three shakes cinnamon, water cold from the filter. i find my shoulders wrapped, my back steadied, by that first stroll through the garden. find myself cheered by the pumpkin vine that’s set down roots amid my black-eyed susans. i like that i keep measure of its bold insurrection, the way it’s up and inching through the beds, hellbent on making a kitchen plot of my measly perennials. i am heartened, too, by the red-cloaked gang of cardinals who chatter and pester me for more seed. i am soothed knowing that they know they can count on me. i will be there, they must have figured out, like clockwork. i’m a girl they can set their clocks by. when i think ahead to that spot around the bend that i can’t quite imagine yet — the morning and the days when his absence is first felt, when it’s raw, when the silence is so loud it makes me want to scream — i know already that my soothing, my balm, will come from all the little chores that steady me, that fill me. i’ll cut stems from the garden, arrange the daisies and the black-eyed susans and the queen anne’s lace. i’ll fold the laundry. fill the pantry shelves. i’ll try not to wince when i pass up the pack of cookies that he loves, knowing if i bought them they’d sit untouched till thanksgiving, when he comes home for a few short days. i’ll try not to miss the teetering piles of his T-shirts, socks and gym shorts on the ironing board downstairs. try not to miss that the laundry basket won’t be nearly as heavy anymore. and when the sting comes, when the salty stream of missing him fills the cuts and scratches on my arms and legs and heart, i will turn once again to the time-worn knowledge of my heart: i’m a girl who hums when i am bound on all sides by the familiar, the tick and tock of home. when my house and garden do their job, and shelter me from the storm that is life simply moving forward…..
for the blessing of home, of garden. for the gift of all these blessings. for the gift of a boy i love so much his absence will be a hole inside my heart. for all of this, i am so deeply grateful. are you soothed by the familiar? do you find music in the same old sounds inside your house? are you a creature of habit? or do you find glory in the new, the exotic, the not-yet discovered? for seven sweet days, we escaped. i though had my heart set on one thing: savoring the days, the hours, the minutes. every drop of it. i licked my lips of it, let it drip down my chin. didn’t care a whit if it stained the front of my shirt, so sweet was the one last chance to slip away, to stay at the little mirror lake where we have spent sweet summer weeks in the past. what he meant, of course, was this was the last time the homecoming would be back to the place where he’s grown up, where he’s spent his years since the middle of fourth grade, the place that soon won’t be the epicenter of his daily whirl. while we were motoring home yesterday, the chicago tribune, that newspaper where i type, was running an essay they’d asked me to write, about taking my firstborn to college. because there is never enough room on the printed page, it had to be trimmed at the last minute. but i never have to trim here, not if i don’t want to. and this time i don’t. 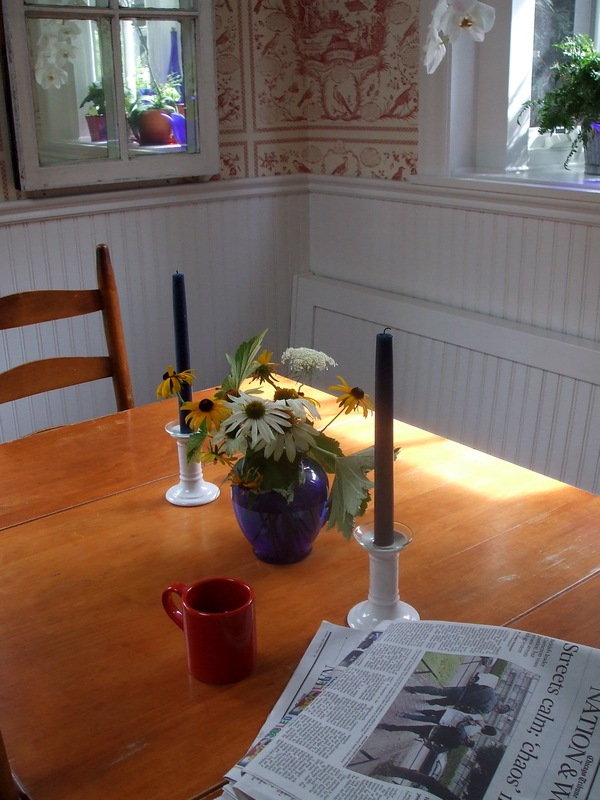 and besides, plenty of you don’t read the tribune, don’t have it slap on your front stoop, come sunday mornings. so for all of you, and for the record, here is the unedited version of “roots and wings,” an essay that ran in the chicago tribune of sunday, august 7, 2011, less than three weeks before my firstborn shipped east for college…..
I’ve been practicing for months. Practicing what it will be like when, in a few weeks, my firstborn is packed up, flown off and settled into a dorm on a campus on a hill in a town some 1,000 miles from the old house where his stirrings have been the backbeat to my every day. Just to see what it feels like, I find myself walking past the bedroom that’s hard off the landing on the way up the stairs. I peek in, see the bedclothes unrumpled, just the way he left them. Sometimes, if I’m drawn in, I take a few steps beyond the door, look around, breathe deep of what it will be like — when the piles on the desk no longer teeter, when the soggy towels aren’t plopped on the floor, when, for months at a time, there’s no trace of him in our midst. My firstborn, at last, is headed off to college. And while, for the life of me, I cannot picture this place without him, I know deep down that the whole point of this exercise called parenting is this soon-to-come parting, no matter how hard. While I might be practicing this new long-distance mothering — imagining what it’ll be like to not see the light shining from under his door at 3 in the morning, to not hear his books thump on the counter when he lopes into the house, to not wake at 5 to stir his oatmeal and send him off with a hug and a kiss — and while I can’t even begin to imagine how it will feel to look into his eyes one last time and walk away there on that leafy New England college quad, I do know that the real work started long ago — and for that there was no practice, only sheer trial by error and hope. Day after day, hour by hour, bump after bump, for the last 18-plus years, I’ve been getting him ready for this great divide. I was cradling that lanky baby in my arms, back in our city garden one hot Sunday afternoon, when a wise friend of ours, a priest actually, stood in front of a circle of people we love and told my husband and me that we had but one essential job: Give that child roots and wings. Roots, so he is forever grounded, solid, deep. Wings, so that some day the wind will catch beneath him, and he will soar. Roots, I’ve come to learn, are laid down slowly. They’re laid down late at night in kitchens, when the tears come, and the stories from the playground are enough to break your heart, but you stand there like a sponge, taking it all in, soaking up every drop of the hurt, whispering words of unswerving faith. They’re laid down on long walks where you listen to the boy spill his dreams, and you let out his kite string; you say you believe, and you mean it. They’re laid down after school at the kitchen counter, when you open wide the refrigerator and let him have at it, while you sop up the dramas of the day, you listen to the questions and the quandaries, and you offer up the scant teaspoons of wisdom you have to offer. They’re laid down so when you get to this summer — the summer when your kid packs up the boxes, leaves home, steps into the college life of which he’s dreamed, for which he is so very hungry — you can stand back and watch what happens. What you hope, what you pray for, is that while you’ve been hard at work cultivating those roots, the wings, undetected, began to unfurl. Oh, sure, you’ve seen starter flights. The road trip in a car packed with 18-year-olds where you stayed home and held your breath. The lightning storm that hit when your kid was out on a boat in a river, and somehow he made it back to shore and stay alive, holed up — in defiance of science and common sense — in a metal boxcar used as a boathouse. But, so far, the nest he has flown home to was yours, the one you’ve watched with vigilant eyes. From here on in, the wings and the flights are all his. p.s. 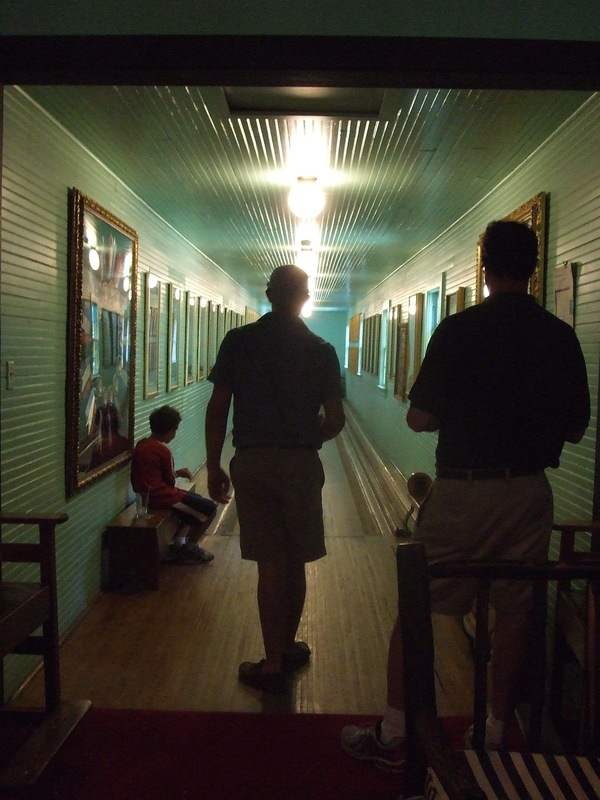 the photo above is an old-fashioned bowling alley, maybe the oldest in america, that we discovered on our little week away on mackinac island. my boys in silhouette. i love the way the light plays off the monticello blue walls…..